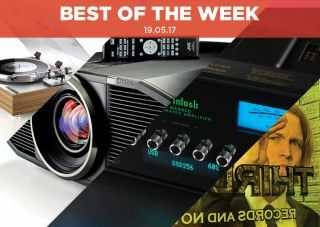 Best of the Week: JVC 4K projector, Sony Dolby Atmos soundbar, Munich High End Show 2017 and more | What Hi-Fi? This week Sennheiser revealed a special-edition, Pink Floyd-styled version of its Momentum HD1 Wireless headphones, McIntosh announced two new products in the MA8900 amp and MCD350 CD player and Thorens unveiled a new range of retro-styled turntables. Among our new reviews we have JVC's brilliant DLA-Z1 4K projector, Sony's Dolby Atmos ST-HT5000 soundbar and Urbanista's Seattle Wireless headphones. Sennheiser has celebrated its involvement with the V&A's Pink Floyd retrospective by releasing a special edition of its Momentum HD1 Wireless headphones. Inspired by the 1973 classic Dark Side of the Moon, the headphones feature rainbow-coloured stitching on the leather styled headband, a prism symbol on the earcups and a 'Their Mortal Remains' nameplate. The headphones go on sale in June and can be bought from Sennheiser's website for £380. At the Munich High End Show, McIntosh revealed two new products in the MA8900 amp and MCD350 CD player. The MA8900 is the first to feature McIntosh's Monogrammed Heatsinks, which provide heat dissipation, while the MCD350 has a 32-bit/192kHz DAC, analogue stereo outputs as well as a coax and optical output. They're believed to go on sale in June, but UK pricing is yet to be announced. Thorens has launched its 900-series turntable range, consisting of the TD-903, TD-905 and TD-907. Harking back to the classic decks of the 1960s and ’70s, the retro-styled turntables are made out of triCom, which offers excellent damping properties. They can also accommodate a wide variety of 9" and 10" tonearms from third-party manufacturers. There's no concrete release date for the 900s, but they are expected soon. Binaural audio: what is it? How can you get it? So far, we haven't heard a Dolby Atmos soundbar we'd wholeheartedly recommend, but this Sony is set to change that. It's a fantastic effort; a soundbar that boasts a distinct sense of space and movement both in front of and above you, making for a more immersive experience. It's also quite possibly the most fuss-free way of getting Atmos in the home. Without a doubt the best effort we've heard so far. While the Urbanistas aren't the most outstanding-looking headphones, their unassuming appearance conceals a terrific sound. They're one of the best-sounding headphones under £100, producing a sound that's detailed and engaging, with smooth mids and a sweet treble. The lack of aptX is a bugbear but, for the price, they blow their peers out of the water. Let's get right to it; the JVC DLA-Z1 is one of the best projectors we've ever tested, offering some of the finest images we've seen in our test room. It puts in a stunning performance, whether we're dealing with 4K, HDR or Full HD, producing excellent colours and superb contrast. If you have £35,000 lying about, you should happily chuck it at this projector.